Have you ever thought of main aims in your profession and where you would stand in the next few years? In the same manner have you ever observed what you’ve done at the finale of your day? For these aspects, setting goals in life in the career track is mandatory, goals are the only key which keeps you focused and directed. It is also an indicator which signals you if you’re on the right track and succeeding. The basic necessity for any goal to be achieved is that one should know the methodology of setting it. To achieve career success proper planning and certain golden rules are required. A few pointers for career success are mentioned here. Learning potential is a talent that all individuals in the industry should possess. If you really want to achieve something in your career, it is mandatory to research and learn to achieve it. One of the many golden rules for career success is that you should learn the latest up comings and happenings in the industry. This can be done by keeping an eye on the various bloggers too. During your course of job in an industry you must have met many people and there must be some specific person in the industry that you admire. The special person can be your family member, one working with you, or even someone whom you do not know. It would be suggestible if you could contact them ask them for tips and get their help. Get permission from them to meet you on a regular basis or make your conversation over an email. By seeking help of a mentor, more techniques in the field can be learned. Attitude of a person is a very significant aspect which marks your success in career. Possessing or developing a good attitude is also considered as a golden rule for career success. It is always good to take up more responsibility and maintain good name at work place. There may be hassles in work place, which can be best handled by sharing with friends or family members. Try not to be a complainer and gain a bad name. Being a leader in an organization requires certain qualities. You should present youself as a leader whom you desire to follow and respect. It is really a challenge to be a leader where he needs to handle adverse situations and make changes. It is thus mandatory to be a leader who has confidence, possess good communication, persuasive, unwavering and thorough. Another important golden rule to be successful in your career is to be a boss for whom you love to work for. Being a boss it is important to enthuse and encourage your employees rather than failing to participate them at work. Being a boss one should have the quality to build good relationship, should be passionate, hard worker, a good leader, and also a good communicator. Business is a unique world where winning and losing is a part of the career. Any individual possessing any designation in business learn to accept all failures as victories too. Every stage in career would have stepping stone and would teach you something from failure. In that aspect looking into failures from a varied perspective is also a golden rule for career success. You may bloom each day in your career with legion of ideas, make sure you pen down them so that you remember it after some time. Good ideas are a special gift and they vanish away when new plans make an entry. So make sure to write down those best ideas as it pops up in mind. It is always a good habit to make a list of whatever that has been accomplished till date. This is good because any query can be raised at any point of time and so keeping track of achieved tasks is another golden rule for career success. It is good and a basic foundation to possess good relationship within the work place. When good relationships are developed, an employee would feel comfortable within the industry. It is important to be comfortable with all colleagues especially your senior managers. There isn’t any situation without confusion and issues in a workplace. As an employee when you have decided to take up any issue to your boss make sure you also have a solution to suggest your boss. When you’re up with a solution, your boss may get impressed with it if it’s fruitful. This is also considered as a golden rule for career success. It would always be suggested to work in the work place rather than complaining, grumbling and other unwanted activities. Remember you are paid for working and thinking of company’s success rather than other personal chores. When you’re assigned a task, it is important that you come up with the right result before deadline. Working for long hours does not mean that you’re perfect but obtaining the right result at the right time is important and noticed. Arriving early to work has a number of beneficial factors and also shows your work ethic. By getting early to work you can impress others, you can maintain peace and remain quiet, can get hold of early calls, and many more. When you’re before your boss, you are remembered and grab his attention too. The basic cause for failure in business is procrastinating. Working on a project from the start would be suggested rather than rushing to complete it at the end. Many employees procrastinate chores as they lack skill, scared if it would fail, fear as its new and unknown, missing homework, and also absence of confidence. To accomplish best results and also to carry on your career goal in the right path, the best part of the day where you’re active and focused on work should be identified. Some can achieve their task the best in the morning start of the day, some at night, some under pressure, and some at relaxed time. So plan and list your day’s job and complete it as planned. This is another golden rule in career success to be followed. Another golden rule to excel in career is to treat every individual at work place with proper respect and good manners. Respectful behavior is necessary to be shown from the cleaner to manager. By this way they stand to be a work model to others and in the same manner, good behavior and manners are spread across the organization. Strong knowledge and skill to write business letters is the basic requirement to excel and sustain in business. Business letters have certain criteria and are required to be followed by the employees. Having the skill to write good business letters is a mandatory rule to excel in career. When your friend or colleague is in the process of hunting a job, take initiatives and help them in networking as they in turn can help you in future. By helping those in networking you can help them get linked to legion opportunities and information. In this manner the job questers network is also enhanced and powerful resources are gained. When you have more of workload in an organization keep yourself focused and also make sure to prioritize work. An important golden rule to success in career is to work accordingly for what work has been planned. Remember to pick a niche where you can enjoy work, excel and work to become a leader. When you love your work, you’re sure to excel and reach success within stipulated time. This is an important rule to excel in career. Customers are the only asset for any business which leads to success. Gaining good customers is the main intention for many businesses. For the same reason possessing good customers and serving them in the right aspect is important. A business sustains when their customers are satisfied. These are a few golden business rules which can be incorporated in any individual’s life in order to succeed in business. There are a number of fresh and young entrepreneurs who can find the above tips beneficial. A few abilities and skills along with hard work can be the best choice to carry on your business. 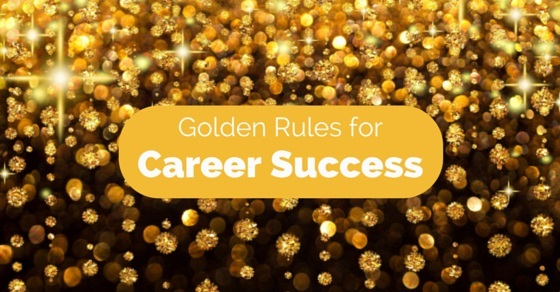 These golden rules mentioned can add flavor to one’s success in career. Glimpse through the hints above and incorporate them in your career to accomplish your dreams and succeed in career.